I made a few tail lamp circuits and the tail lamps themselves for a friend who models in OO. There is a lamp at each end of the guard's van, and the correct one lights for the direction of travel. 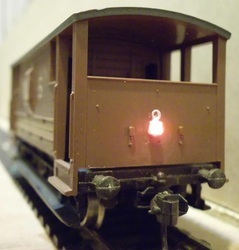 The lamp comes on at full brightness just as a typical loco starts to move (around 5V on the track), and is flicker-free under normal minor pickup and track problems. The capacitor means that minimal a one-wheel-per-side pickup is adequate. 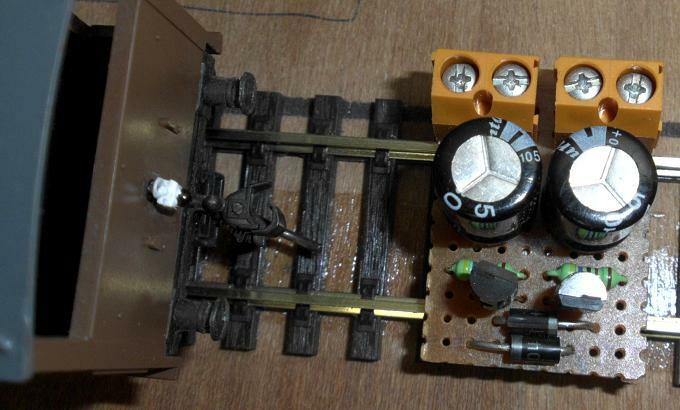 An N gauge variant is doable, but space would only permit a single circuit (lighting both ends all the time), so the directional feature would be lost. The unit is intended for conventional DC - if used with DCC you would also lose the directional feature. 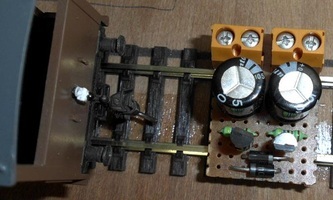 The circuit is completely conventional - just a 5V voltage regulator for each direction. The only tricky feature is getting by with just four screw terminals instead of the more obvious design using six. The regulator should be the low-power 78L05 version since this is much more compact and has a lower leakage current - a smaller capacitor is required. The capacitor must be a 25V part, since peak track voltages can reach 20V with most controllers. The larger the capacitor value, the longer the LED stays on, but the more space is required. A choice of 330uF gives almost a second, but 220uF would be adequate. Shop around for capacitors, since different brands stocked by different electronics stores often are different sizes for the same rating. The resistor value should be chosen to give the desired brightness, and will depend on the type of LED chosen. 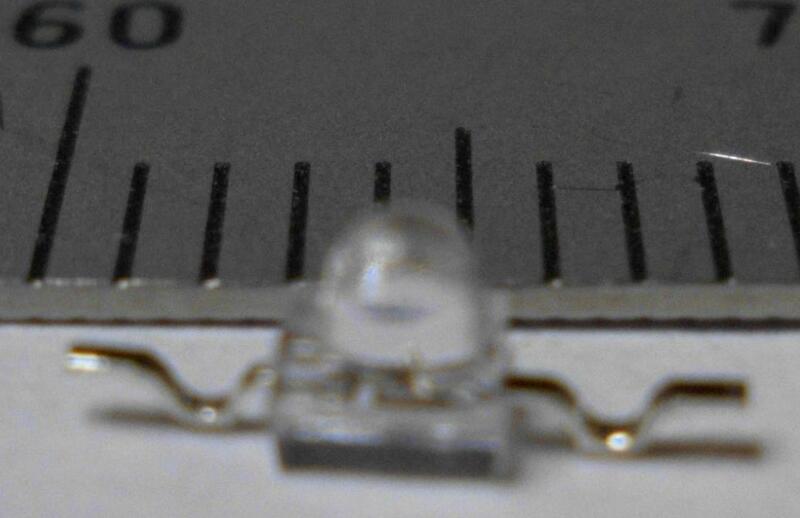 The LEDs used are small very bright surface mount types. They happen to be just the right size and shape for OO scale lamps, and the gull wing solder tags can be bent to form a mounting bracket and handle (assuming the LED is mounted vertically). The round handle was made from a loop of thin single-strand wire (sold as wire-wrap wire in electronics stores) wrapped around the shaft of a small jeweler's screwdriver and soldered to the top tab. The whole LED illuminates when powered, so if you simply paint it white you will find that the paint is translucent - the whole thing glows. Give the lamp a complete coat of black paint first, then illuminate it to see if there are any cracks. The red lens was colored using a red felt-tip permanent marker pen.